Antonio Falvo first appears in Fairport Harbor, Lake County, Ohio, between 1909 and 1917 when he Declared his Intention to become a Citizen of the United States at the Lake County Court of Common Pleas. The declaration was not dated. He listed his address as Lake Street, Fairport Harbor. Antonio Falvo, son of Giuseppe Falvo, was born on Monday, May 2, 1892, at Gizzeria, Italy. He immigrated to the United States on April 21, 1909, at age 16, travelling to Alliance, Ohio. He was joining his brother Raffaele Falvo in Ohio. 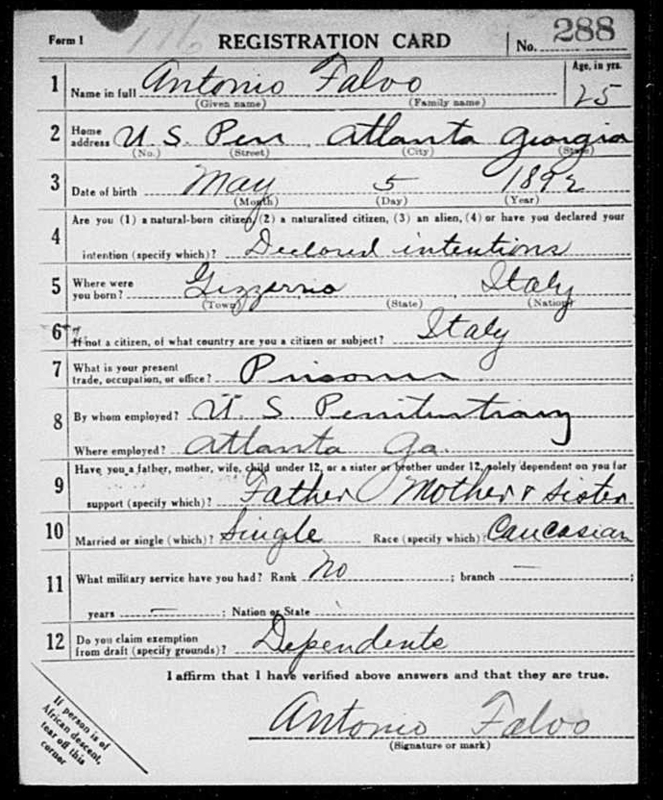 Antonio registered for the military draft for World War One on June 5, 1917. He was a prisoner at the United States Penitentiary, Atlanta, Georgia.